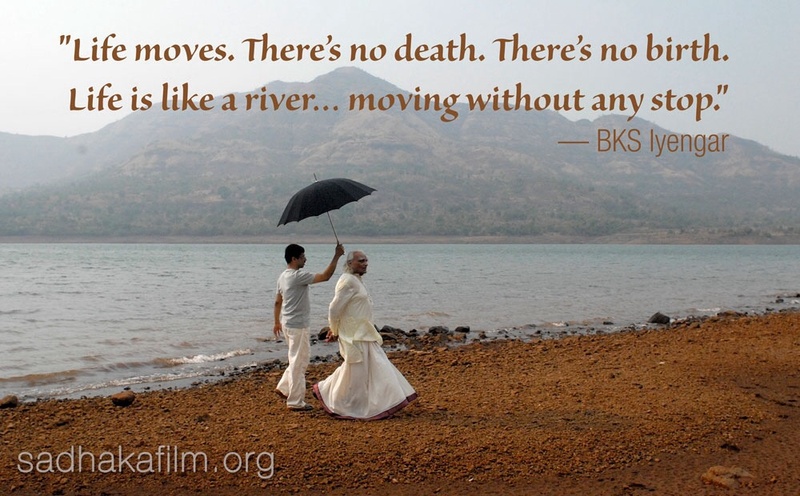 Yogacharaya BKS Iyengar was a world-renowned yogi and yoga teacher. He was credited for bringing yoga to the West and was named one of the top 100 most influential people in the world by Time Magazine in 2004. He died in August 2014, at the age of 96, and his family continue to practice, study, develop, and promote his teaching methods. The Iyengar method is hatha yoga that follows the 8 limbs (yama, niyama, asana, pranayama, pratyahara, dharana, dhyana and Samadhi) of the Astanga path. Focusing on the correct alignment of the body, making use of props and other objects as aids to achieve correct postures, striving towards longer holdings, adding pranayama once advanced techniques are established, and bringing “mediation in action” are major differentials to Iyenagar’s systematized and internationally regulated yoga practice. Guriji has dedicated his life to the study and advancement of yoga. The Iyengar technique, sequence and timing are some of the major characteristics that define the Iyengar yoga system. Technique means that in practice we learn finer adjustments in the alignment of how we perform asana and pranayama. Sequence refers to the pattern in which asana and pranayama are practiced. For example, by varying postures and noticing when they are practiced can influence the mental and emotional effects of the practice. The sequencing can be integral in intensifying the effect of a posture. Timing refers to the length of time spent in postures or pranayama. It takes time to move into a posture and become stable. Time allows us the potential to intensify effects and benefits that otherwise remain small when time is compromised. The combination of the Iyengar method has been systematized and is based on anatomical principals. For each asana there is a correct position for each body part so that each individual body part, as well as the various physiological systems, may function to their greatest potential. The Iyengar approach recommends at least 2 years of asana practice to strengthen the body, nervous system and lungs before being introduced to the practice of pranayama. Mr. Iyengar found that if a novice tries to concentrate on breathing while perfecting a posture he loses his balance and the depth of the asana. It is only after one has attained steadiness and stillness in the asanas that the student is ready to be introduced to the rhythmic breathing techniques of pranayama. This leads to another keynote of Iyengar yoga: meditation in action. Mr Iyengar focused his meditative practice on the posture one is performing. At first the mind moves from part to part but with training the mind learns to become absorbed in all parts of the body evenly at the same time. The constant interchange between body and mind of each subtle movement and action experienced in an asana is a type of meditation Mr Iyengar referred to as “meditation in action”. Attention is brought to a body part, then concentration of this body part, followed by awareness and concentration of another body part. This continues until the attention is diffused all over the body without any lessening of intensity of concentration. This is the Iyengar methodology to meditation that differs traditionally from other practices that are more actice or concentrated on mind meditation. It seem the Iyengar method could be described as more organic to the physical process bring meditation to the body and mind compared to the mind and then body. Iyengar Yoga also distinguishes itself from other systems by its therapeutic application of the postures. Modifications to the postures developed by BKS Iyengar allow for maximum benefit for people with disabilities. Mr. Iyengar was recognized worldwide for his knowledge of the body and his expertise in treating complex medical problems. Another distinctive aspect of Iyengar yoga is that it involves very little vinyasa flow (fluid transition from one pose to the next in conjunction with breathing), which brings Iyengar yoga within reach of a broad population. Instead, poses are held for longer durations while the alignment is perfected. Between poses, students use recuperative poses. Therefore, Iyengar yoga is not as intense a cardiovascular experience as a more flowing style such as Ashtanga. However, an advanced Iyengar practice with inversions, longer holdings, and sequenced with resting poses, could result in cardio-vascular benefits similar to that of circuit training. Holding the poses in itself however, is strenuous, builds strength, and is excellent for increasing flexibility. Iyengar yoga is a healthy and safe place to start for people who are not physically fit enough to attempt a flowing style of practice. This includes people who are ill, elderly, and overweight or may suffer from Scoliosis, Arthritis, or other degenerative conditions. That being said, Iyengar Yoga is for the healthy and the ill, the young and the old, the able and the disabled. Props have been developed by Mr. Iyengar to help those with limitations to achieve perfection and maximum benefit of the classical poses. The sequencing and the timing of the poses are approached in a systematic manner to maximize the cleansing, strengthening and balancing of all the body systems. This approach also leads to a calm and focused mind, and prepares us for the meditation in action and ultimately Pranyama. From the Yogi Times article published HERE.